VANCOUVER, BC -- (MARKET WIRE) -- April 5, 2007 -- Sutcliffe Resources Ltd. ("SR" or the "Company") (TSX-V: SR) is pleased to announce details of its forthcoming exploration program of the Ozherelie and Ykanskoye gold projects in Irkustk Oblast region of East Siberia, Russia. Sutcliffe Resources through its wholly owned subsidiary Baykal Gold acquired an initial 51% interest in ML Ltd which owns 100% of the Ozherelie and Ykanskoye projects. Sutcliffe Resources has an option to purchase the remaining 49% (please see the Company's December 21, 2006 news release for complete deal terms). The two gold deposits are located within a highly mineralized belt which includes the world class Sukhoi Log gold deposit as well as a number of other hard rock and alluvial gold mines. The region has historically produced a reported 48 million ounces, making it one of the most prolific gold producing regions. Approximately 10km apart, Ozherelie and Ykanskoye are located in two separate mining licenses with terms of 20 years from August 2, 2006. Sutcliffe has initially budgeted US$12.0m for exploration at its Irkutsk properties, which will include over 15,000m of core drilling, 40,000m of RC/conventional air rotary (BTS) drilling and 30,000 cubic meters of trenching. Two large diameter core rigs are currently being mobilized with drilling on both gold properties due to start this quarter. of the current known resource areas. 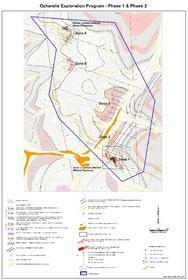 At Ozherelie, five mineralized zones have been identified by ML Ltd, as detailed in the enclosed Ozherelie plan. The approximate strike length comprised in the resource blocks of Zones 1 and 4 is only 0.5km, leaving more than 6.5km of potential strike remaining to be tested. In the first phase of exploration, a 480m x 160m drilling grid is planned along strike and down dip of the current resource in Zone 1. In addition, three widely spaced drill fences will test the continuity of the mineralized horizon between Zone 3 and Zone 4. Due to the coarse free gold nature of the mineralization, core drilling will also be supplemented by a significant amount of trenching, and BTS drilling primarily in Zone 3. For Phase 2, exploration will be augmented with a large diameter RC drill rig. 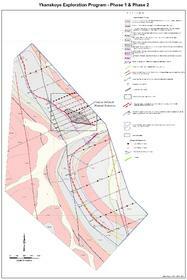 Drilling will concentrate on expanding known resources around Zone 1 through in-fill drilling on a 120m x 80m grid. Currently at Ykanskoye, trenching has only been along approximately 1.4km of the potential 6km strike length. In Phase 1 of exploration, additional trenching will be completed along the remaining 4.6km of strike length. Furthermore, seven widely spaced fences of core holes (approx 1km apart) are planned to test down dip continuity, as detailed in the enclosed Ykanskoye plan. Phase 2 exploration will concentrate on expanding the current resource in the central-north area of the property through step out and in-fill core drilling on a 120m x 80m grid pattern as detailed in the enclosed Ykanskoye plan. In addition to the above exploration programs, Sutcliffe, through ML Ltd, will prepare a centralized database and data verification program from ML's regional exploration office in Bodaibo, Irkutsk. Robert Maddigan, Director of Sutcliffe Resources, comments, "Following the successful acquisition of four Russian gold projects in the second half of 2006, we are now entering an exciting period for the company. Following rapid mobilization on the ground, exploration at our two highly prospective Irkutsk properties, on one of the world's major gold trends, will start in just over a month. At our other properties in Chukotka, camps will be constructed in Q2 ahead of our summer exploration program." Sutcliffe Resources is also pleased to announce it has filed with the TSX Venture Exchange its National Instrument 43-101 independent technical report prepared by Gustavson Associates, LLC on the Company's Irkutsk projects in the Russian Federation. The report dated March 20, 2007 and entitled "Technical Report on the Ozherelie and Ykanskoye Gold Projects, Irkutsk Oblast, Russia" is filed on www.sedar.com. Please note that the maps provided in this press release can also be viewed in the 43-101 report. Mineral Resources and as such are therefore NI 43-101 compliant. employed to estimate the mineral resources. that only a small portion of the prospective ground has been explored. ML Ltd. is a gold mining and exploration company incorporated under the laws of the Russian Federation in June 2002. ML has an exploration office in Bodaibo and a corporate office in Konakovo. ML retains a staff complement of 20 qualified employees who are currently assigned to preparing the infrastructure around the projects in order to commence the drill and trenching program. Sutcliffe Resources is a gold exploration company whose primary focus is to become a mid-tier gold producer through the advancement of its gold exploration properties in the Russian Federation. In addition, Sutcliffe's management will continue to evaluate acquisition opportunities within the Russian Federation. Sutcliffe's philosophy is to unlock shareholder value in a socially and environmentally responsible manner. William J. Crowl, R.G., an independent consultant, is the "qualified person" (as such term is defined in National Instrument 43-101) responsible for the preparation of the technical information in this release. About this company Sutcliffe Resources Ltd.